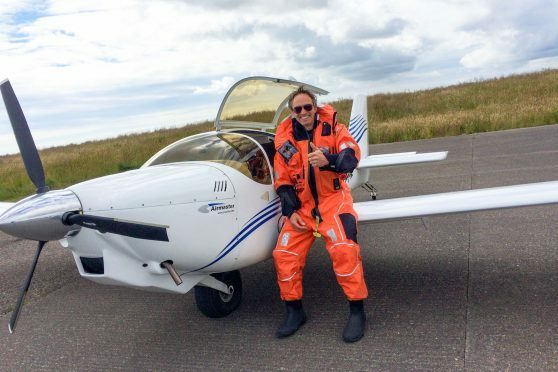 A Belgian adventurer landed at a north-east airfield during a bid to fly his homemade aircraft to the United States. Dirk Oyen stopped off at Longside airfield en route to America in his single engine Europa, which has a maximum speed of around 150mph. No stranger to exotic travel, Mr Oyen previously rode the length of Africa and Europe on a motorbike when he journeyed from Cape Town in South Africa back to his home in Hasselt, Belgium. Mr Oyen, a lecturer in engineering, had planned to fly north from the Buchan aerodrome to Iceland before turning west across the Atlantic towards Greenland. His final destination was to be Oshkosh in the state of Wisconsin where his 5,000 mile journey would end at one of the largest airshows in the world – EAA Air Venture Oshkosh. Sadly poor weather forced the intrepid adventurer to turn back. Last night Neil Willox, a member of Buchan Aero Club from Longside airfield, explained why Mr Oyen had stopped off in the area. Mr Oyen’s journey was planned to coincide with the 90th anniversary of Charles Lindbergh’s 33-hour flight between New York and Paris – the first solo transatlantic flight. This month’s effort was backed by Mr Oyen’s local radio station in Hasselt – which is coincidentally called Radio Limburg. A spokesman for the station confirmed Mr Oyen’s journey was ultimately unsuccessful. The spokesman said: “He made it to Scotland. He couldn’t fly any further because of the very bad weather. So he came back to Belgium. The adventurer and university lecturer is currently holidaying in France and was unavailable for comment last night.